Oct. 6 - Half day driving tour. Our last fling of the season in a group driving event. Details here. Oct. 7 - Last Cars & Coffee of the season. Lake Mills. Details here. Oct. 14 - Wine Tasting at Lewis Station Winery, Lake Mills. Details here. Oct. 19 - Drive for Babies at Road America. Details here. Oct. 22 - Deadline to submit nominations for the next board of directors. Details here. Nov. 8 - 11 - Escape. PCA's mini Parade in Arkansas. Details here. Dec. 8 - Holiday party. RSVP deadline is Nov. 1. Details here. June 8 - Ladies Driving Tour to Washington Island, Door County. Save the date, ladies. Here are the details. Board meetings - first Thursday of the month. Wisconsin Club Country Club, N. 62nd and W. Good Hope Road, Milwaukee. 6:30 p.m.
How often in volunteer circles do you run across an individual or couple who jump in to help lead an organization and stick with it for decades? Not often, right? The Milwaukee Region of Porsche Club of America has been fortunate to have Gary and Renee Messing as dedicated, involved members. Both hold memberships in PCA. Shortly after joining PCA in 1991, the Messings were raising their hands to participate actively. Their home was the first site of the region’s now legendary Carrera Chili/Turbo Spaghetti social event that is held in late winter every year. Gracious hosts, they’ve hosted the event multiple times over the years as members have filled their living space for an evening of pure fun. They quickly were elected to the board and for the past two decades there’s always been a Messing on the board. 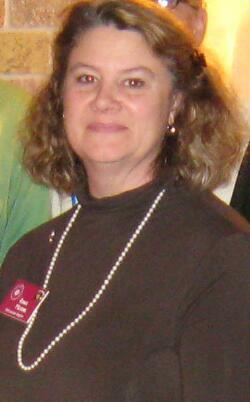 Renee has served as treasurer for multiple terms. Both have served as region president. Gary and Renee are not seeking re-election for 2013. They are looking forward to enjoying region events without the added responsibilities of board directorships. They’re entitled to some down time after their many years of service. Besides their leadership on the board, Renee and Gary rose to national prominence as they served as co-chairs of PCA’s annual big event – Parade – in 2001. They recruited a competent, committed group of committee chairs to plan and deliver an outstanding Parade experience for nearly 2,000 PCA members who enjoyed Milwaukee’s lakefront and downtown hotels and restaurants. As Parade co-chairs, they had to deal with every detail that comes with Parade leadership, from last-minute registrations to lost items, from protests about concours d’elegance scoring to complaints about banquet accommodations. The hours of sleep that both got during the week-long parade were minimal. Neither left the hotel's Parade registration room for the better part of the week-long Parade. Years later Gary Messing stepped up to co-chair the planning for the region’s 50th anniversary, a year-long celebration with multiple events, culminating in a formal dinner at a local country club with nationally recognized guest speakers. Region members also have seen Gary and Renee at the autocross events, helping with registration and scoring. They also participate in drivers education, driving tours, autocross and social events. Their involvement – whether as an organizer or a participant – is a model for all of us. The region is grateful to Renee and Gary for sharing so much of their personal time to advance and strengthen the region. We wish them all the best as they continue to enjoy membership in PCA. "Last year I had the opportunity to acquire a black 1983 944 Porsche. For 20 years I owned an auto body shop, and since retiring from the auto repair business I have been looking for the perfect car to restore. "My goal for the 1983 944 is to completely restore it to pristine condition, but while working on the 1983 944 I still needed a Porsche to drive in the meantime. This need lead me to the purchase of my red 1986 944 Porsche. 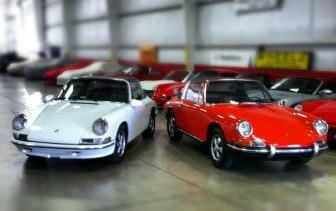 I found my 1986 Porsche on Craigslist from a shop owner in Cudahy, near the Milwaukee airport. "He acquired the car from a BMW customer in exchange for work on her BMW. I have always appreciated German made cars." Scott says he is interested in all PCA activities/events. He is currently employed at Grafton Transit Inc. located in West Bend, Wis., as a truck driver. Meet the board - An ongoing series of profiles by members of the board. John and C.J. McGarry and their 2009 Cayman. Like most of my fellow PCA members, my fascination with cars has been life long. As I grew up on the East Coast, I began constructing go-karts and mini-bikes. These were driven in various locations, both proper, and not so proper. At 18 years of age, I managed to buy the first of my three Volkswagen Beetles. They followed my very brief and amusing motorcycle stage, during which I learned that motorcycle riding in November is cold. All of the original, air-cooled Beetles had the enchanting sound of a belt-driven cooling fan. I believe that’s what started the Porsche thing for me. I embraced the American muscle car era with gusto in the late ‘60’s, but was uncharacteristically drawn to local autocross events. A friend, Dean, very skillfully drove a white Porsche 356 Speedster. One day, I saw him run a borrowed Porsche 914 to within about a second of the fastest time posted by a well driven Porsche 911S. I knew he was on to something. A family move to the Midwest kept me away from fast cars for several years, but I started to see beautiful and stylish Porsche 924s on the road in 1976. In 1978 I visited Mossner Motors in Shorewood, where several were in stock. I test drove a yellow one with a dark brown interior, 4-speed, and alloy wheels. Compared to my aging1972 Chevelle station wagon, it sounded and felt like a Formula Ford. I borrowed every dime I could and bought it. I had two delightful years with that car. I bought snow tires so that it would tolerate the winter, but it was truly a spring and summer car. It could fly down a country road. To me, it looked like an exotic. It was so stable on I-94, that it felt like it was on rails. Perhaps best of all, it had the Porsche crest in the middle of the steering wheel. I drove it everywhere and loved it. As fate would have it, a change in my work situation necessitated a change to a 4-door vehicle in 1980, so the beloved 924 was traded for an Audi. In the busy years that followed, many other priorities took center stage and sports cars had to be set aside with other youthful passions. Twenty nine short years later, my wife CJ, and I embarked on a search for a nice, pre-owned Boxster. We called my friend, Jerry Zimmerman at Concours, who quickly found us the car of our dreams: a spotless, red 2005 base model with a beautiful tan interior and only about 22,000 miles on it. I waited one day too long to buy it. I’m pretty sure that it went to a guy in Detroit. We decided that it wasn’t meant to be. 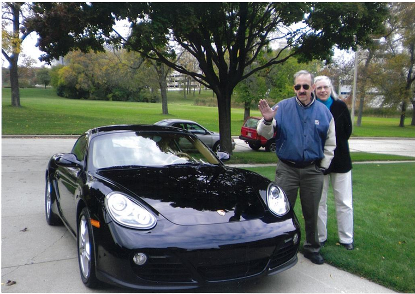 In a stroke of ingenious salesmanship, Jerry immediately sold us our 2009 Cayman. It must have been his way of raising our spirits. He also mentioned the Milwaukee Region PCA to us and we decided to join in October of 2009. Driving tours, the track tour, dinners, tech sessions, and Board meetings followed. Curiosity overcame me, and I had to learn how the Board ran such a fun organization, so I ran for a position on the Board in 2010. It’s been a compelling experience and a great opportunity to see truly dedicated people act as a group. I wish us all many more exciting days behind the wheel and look forward to even more friendships in the future. Read region member Jeff Kuklinski's story of his recent acquistion of a rare Boxster Spyder. Story here. Check out the classifieds. They are updated regularly, not just monthly. Classifieds here. Read the online article and watch a video of his time on the track. Esquire has selected the redesigned Porsche Boxster as its 2012 Sports Car of the Year. 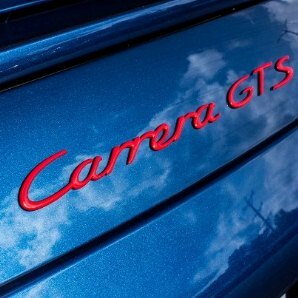 "The Boxster is a near perfect sports car,” said David Granger, Editor in Chief of Esquire. “It’s fun, aggressive and sounds great. It serves as a thrilling reminder that cars still maintain the power to stimulate the imagination." The 2013 Boxster weighs less than its predecessor while benefiting from a longer wheelbase and larger wheels, which enhance the mid-engine sports car's driving dynamics and fuel efficiency. It's too early to put the car away but the time is coming. Be prepared. Read these tips.